But before that let us get a brief idea about WooCommerce Shipping. So finally, you are all set with your WooCommerce store. From setting up products to configuring payment options, everything is done. Now you need to focus your attention towards handling shipment of orders. Flat Rate: Under Flat Rate option, the store owner has to fix a standard shipping rate for the products. The weight or dimension of the order has no effect of the charges fixed by the store owner. The shipping cost will remain the same and customer can place as many orders as he wants. Free Shipping: Under this option, the store has the responsibility of delivering the order to the customers free-of-cost. This means the store cannot claim any charges from the customers. International Delivery: Just like Flat Rate, in terms of International Delivery the store owner fixes a standard rate to deliver the products to an international location. For example, ordering a product from the UK to the USA may result in extra charges which come under International Delivery. Local Delivery: As the name suggests, under Local Delivery the source, as well as the destinations of the product, are within the same geographical area. Local Pickup: Things are a little different when it comes to Local Pickup. With Local Pickup, the customers and not the store owner comes to pick up the order. As a result, this option is least preferred by the customers. Apart from these shipping options, there is a variety of other options too. But these options are based on the shipping services and varies from one service to another. Once you figure out the suitable option for you and your customer and set up the rates accordingly, then comes the product packaging and finding the suitable service that will help you deliver the product. When it comes to shipping services, there are a lot of companies that offer such service. Some of the leading companies in this field are UPS, FedEx, DHL, USPS, etc. But one thing is common with every one of them. In every case, getting a shipping label is a tiring and tedious task. The shipping label contains all the key information necessary for every actor of the supply chain to move the package from one hand to another, from the warehouse to your customer’s doorsteps. It also contains tracking information which both store owner, as well as customers, can use to track their package. If a store owner wants to deliver a product to the customer, then he has to visit the official website of the company that is offering him shipping services. There he will have to log in every single time an order is placed and he will have to enter the order details to get a shipping label. What if this process can be automated as soon as a customer places his order..? 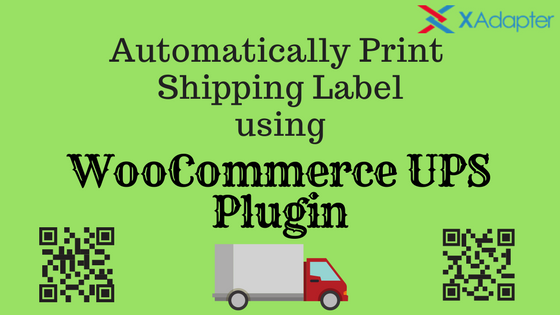 WooCommerce UPS Shipping Plugin offers a lot of features that make it one of the most popular shipping plugin for your online store. Among those features is the automatic package generation and shipping label generation. Consider the case of Jack, the owner of an online art gallery. Since his gallery offers customers to buy paintings and posters, he is very concerned about the package and delivery of his products. Moreover, he wants to automatically generate packaging (based on dimensions) as well as a UPS Shipping Label. You can enable these in the UPS Shipping Plugin advanced settings. For packaging, he opted for Pack Into Boxes With Weights and Dimensions option, based on his preference. It is visible from the screenshot above that Jack has two types of boxes for his products which are based on custom dimensions and weight. Hence, this helps decrease the packaging cost by providing preferred packaging option by the store owner. So these were all the settings Jack had to configure. Now as soon as the customer places an order, a custom box will be selected and the package will be generated automatically. Moreover, Jack will be able to download the shipping label directly from the WooCommerce store. As a WooCommerce store owner, no one likes to waste time and money. No one likes to visit the official website of shipping services like FedEx, UPS, USPS, etc. just to get the shipping label for their orders. As we discussed in the previous section, UPS shipping plugin lets online store owners choose their own type of parcel packaging. Along with that it also provides all the UPS packaging options built-in. So that the store owners can choose to ship their products based on either their quantity or the dimensions. This plugin also saves a lot of hassle of visiting the UPS website to log in there every time the customer places an order, just to get the shipping label. The UPS shipping plugin automates this manual and tiring task so that customers can focus on more important tasks. One of the most important aspects of online shipping is tracking the shipment. UPS shipping plugin is an ultimate plugin which offers order tracking directly within WooCommerce. Moreover, it also provides an option to either permit or limit customers to track their order in the front-end. Since UPS shipping plugin gives store owners the option to customize the packaging, it affects the cost of packaging on a large scale. Now, store owners can choose the type and size of the package of their order. Also, they can select multiple shipping services offered by UPS from within WooCommerce. Both these options can decrease the cost of packaging and shipping of the products to a major extent. If you have any queries regarding the process or the plugin, feel free to share your views in the comment section below.